There are probably 1,001 uses for wooden shipping pallets besides sticking them in a burn barrel. We can regularly source them for free or for very low cost by talking to distribution centers and contractor supply stores about their breakage piles, eyeballing the dumpster areas of shopping centers and warehouses, or checking sites like Craigslist and Freecycle. Spin around online and you can find all sorts of projects and builds for people of all skill levels. They can make our lives easier and seriously cut our costs in many cases. A free item with that much potential makes them an automatic must-have in my book. I’m mostly going to talk about simple builds this time around, but pallets also get turned into pretty impressive structures, gardens, and furniture. 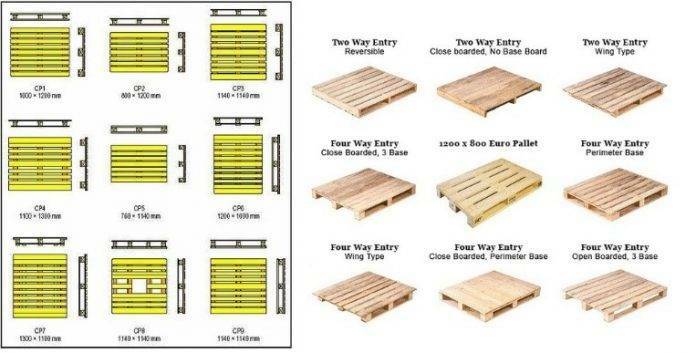 Pallets come in several standard sizes and a handful of configurations. While the type can matter for some of our projects due to the number, cut, and spacing of boards, for the most part applications are pretty universal. 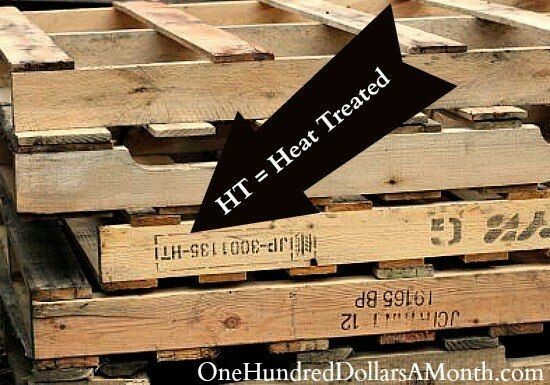 For details about shipping pallet types and sizes, check out this site http://www.airseacontainers.com/blog/most-common-shipping-pallet-measurements/. Remember, once disassembled, our pallets are just lumber. That opens up the whole world of projects. Rifle racks for the range or safes, food storage shelves, bird houses and playhouses; anything we’d repair or build can be done with pallets. Those boards also have use in hiding some of the “ugly” around our homes. 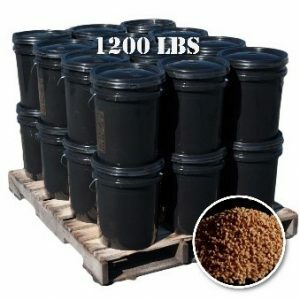 We can use them to sheath everything from our water storage totes and barrels, to whatever containers we’re planting in. 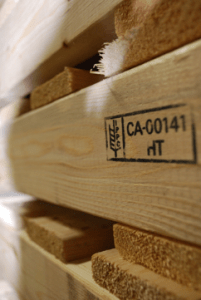 How “safe” the various treatments used on pallets is for us depends on our intended use, even if we’re worried about chemicals. 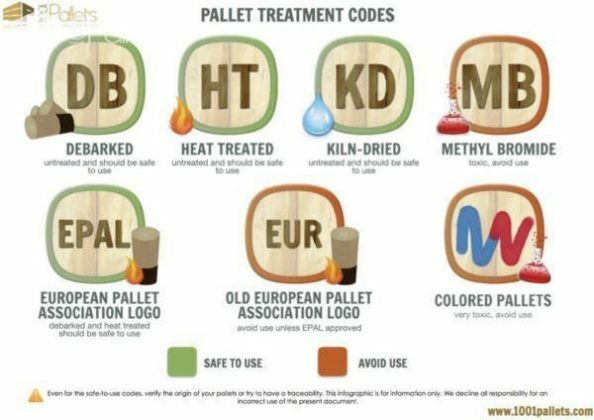 Most articles and videos will tell you that only HT-Heat treated pallets are safe, although others include debarked (DB) and the “safe” EPAL European designator. I’m not going to hand my kids lead pacifiers or mix up powdered milk or pony drenches in bleach bottles, but I also don’t get too wrapped around the axle on some fronts. This is one of them. If you consume Big Ag meats (supermarket to Outback or Whataburger), farmed or bottom-feeder fish, “normal” supermarket eggs and dairy, soda or anything in the center aisles made with corn or soy, or if you drive 3 hours/week, burn trash, touch cash and then your face/food, smoke (anything), handle lead (ammo), sit by campfires, live in a city, microwave food in plastic, use rain catchment without serious decontamination filters, have dark irrigation hoses or foam mattresses, or buy commercial animal feed … don’t sweat those markers too much. One, you’re more likely to die from a vehicular accident, and be hospitalized from supermarket leafy greens or infection contracted in the hospital than from one more of the ubiquitous chemicals around us. 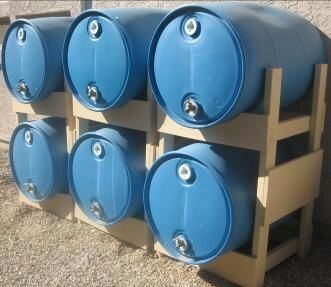 Two, those chemicals mostly only become available as our pallets (or anything) decays. That means tiny increments released over time (vice chugging a can of stain). Chemicals mostly head downward with moisture, with only some outward contact spreading outward – only fractions of them are available for possible uptake. Only fractions of that then ends up in the seeds and fruits we eat. Point is, don’t blanketly accept conventional wisdoms without thinking them through. They may not even apply (or are total bunk). Some stuff, for some/many people, is worth stressing. Some stuff isn’t. 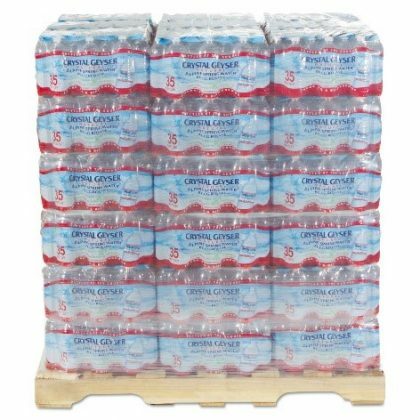 Speaking of safe and unsafe, the conventional wisdom is that we don’t want to store plastic containers, particularly of water, on concrete due to the chemical interaction that allows contaminants to enter our foods. There’s some hot-not and storage-duration wiggle room, and while I tend to err on the side of caution in this case (and when it comes to previous milk containers), there’s some myth-truth proposals here http://www.preparednesspro.com/myths-and-facts-of-water-storage to spur analytical thinking. For the most part, I don’t really see how laying cardboard, 2×4’s, or 1×4’s under plastic barrels and buckets destabilizes them unless somebody gets really cute (or stingy). Personally, I’m a big believer in keeping stuff up off the floor, period. Even beyond chemical interaction concerns, being able to stack stuff also comes in handy, both to maximize storage space and in some cases to make it easier to use. One point to note about water in particular is that it’s heavy. Not only does that apply to any rack we use, it also applies to container sizes. The older I get and more injuries I accumulate and heal, the more I’m willing to downsize. That includes containers for dry goods and water. It’s just easier to build structures for, pull down, move, clean, and refill a 3-6 gallon bucket than a 35-55 gallon barrel. About the only remaining exceptions in my various storage are wheeled trash cans. *Those are not food safe, either, if it’s a concern – told you I’d make heads spin. (Most of my trash cans hold mylar-bagged foods and animal evac feed and supplies; some are wash/laundry water catchment). There’s lots pallets can do for us even if we’re not yet DIY-ers, and lots that requires minimal building skills. For one, just getting stuff off the ground, as mentioned above. 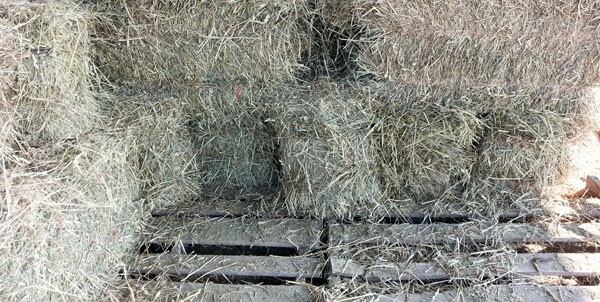 That can be hay, mulch, bagged amendments, toolboxes in our sheds or outdoors, food storage buckets and barrels, or creating elevated resting platforms and feeding stations in pens or pastures that tend to get muddy. They can help keep our boots cleaner – and to some degree limit the risk of slipping in wet and icy weather – by creating walkways, and prevent ATVs, Gators, carts, and bikes from bogging down or tearing ruts on trails and in gardens. They can also decrease or eliminate risks and wetness from ditches and seasonal streams, making getting around faster and easier. If we’re on a tight budget, we might find we can use a boost as well as a stepping stone. We might also decide that a step or hill is a little too much for us as we age, get pregnant, or face injury. 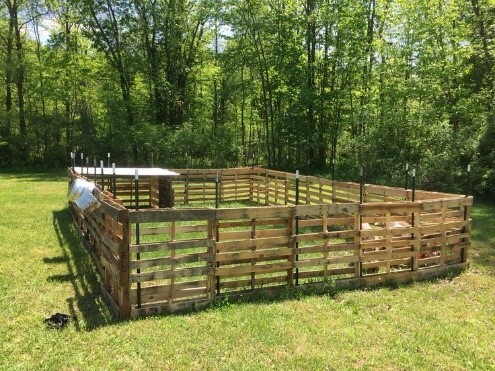 Pallets can help us there, too, and it tends to be a ridiculously easy build. Go easy on how high we go with these things – I’ve seen some crazy. They are wood and even treated, they are eventually going to rot and crack, and need replaced. Also, make sure you anchor these things together and to the ground. If you want or need steps or a sidewalk past mud, a hand rail is usually a fantastic idea, even if it’s just posts somebody can snag. We can turn other pallets into those rails to increase safety and ease. There are plenty of other simple builds out there that at most require splitting, hanging, or trimming an as-is pallet to size, adding some screws or in some cases a hinge, a few hooks, and some cord or chain. 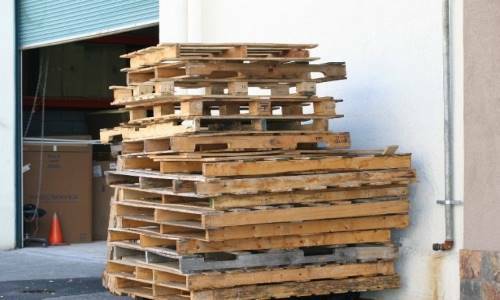 The ease makes pallets a valuable learning tool (and confidence boost) for preppers who are just dipping their toe into DIY. The in-expense also means if there’s a screw-up, no big. Scrap lumber is handy to have around. Some of the simplest ways to use pallets is just to slap three or four of them together to make a work bench, desk, countertop, or table. Flip that on its side, link a few in series, and you’ve got a leaf mold or compost heap. With a sturdy wall or a couple of convenient trees and $3-10 in hardware, and you can make one or two pallets into a permanent or Murphy-bed style station that functions as a desk, a table, or a workbench, indoors or out. With some additional screws and hooks or disassembled boards, we can use a wall or those handy trees to hang our tools in a shed or outside the garage. We can also hang them from the sides of our tables or benches. For a really simple build, just fix a handful of shipping pallets together with deck screws (flip-flop which side is up as you stack to increase shelf depth). Add caster wheels and it’s a rolling storage shelf or workbench. Another super-simple build using just deck screws is stacking a few pallets and adding one perpendicular to form an L shape. 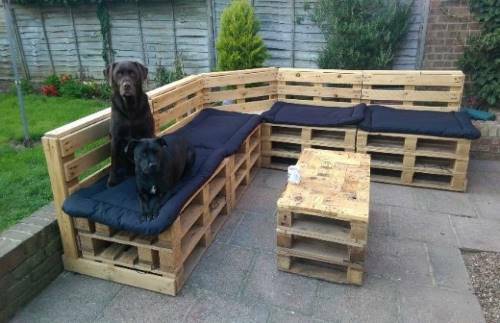 Set that on some cinder blocks and top with a mattress, seat cushions, or pads and you’ve got a bench seat or day bed. Some additional lumber or blocks creates storage spaces for totes, baskets, or drawers salvaged from a wrecked dresser or filing cabinet. If you’re after some inexpensive yard, starter-home, or bug-out location furniture, the sky is the limit and the internet is just full of ideas. Personally, I’m not much for the rustic pallet look, but with a coat of paint or whitewash, our pallets can get prettier if and where it matters. 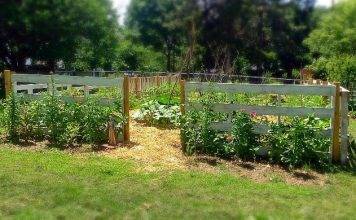 Another fantastic use for pallets that requires little DIY experience is fencing for our dooryards, gardens, and animals, to protect trees, or just to increase our privacy a little. We can use them pretty much as-is and connect them to each other, standard fenceposts, or poles we make our or a neighbor’s overgrown saplings and trimmings. We can also pull a board or two from each to cut at an angle and drive into the ground for stability or to use as an overlapping connector between pallets. If heights of 18-24” work instead of 3-4’, we can very quickly halve our pallets and double the area we enclose. We can also totally or partly disassemble them and churn out top-rail or a 2-3 rail plank fencing, or do some extra cutting for an HOA-acceptable picket fence. If we have problems with raccoons reaching through our poultry and rabbit fencing, we can brace whole or half-height pallets against our existing runs to add depth. Likewise, they can create a buffer to allow some grazing but keep chickens and goats from eating something to the trunk or roots. We can also take pallets apart and reassemble them in a solid wall if our birds/hares like to do dumb stuff like huddle in a corner where something can get its claws through – there’s little worse than a disassembled critter the predator couldn’t even get out to eat. 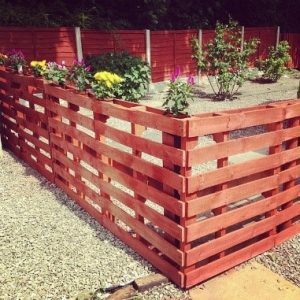 I said I wasn’t going to talk about pallet gardens, but when it comes to fencing, that’s actually one of the benefits they offer. 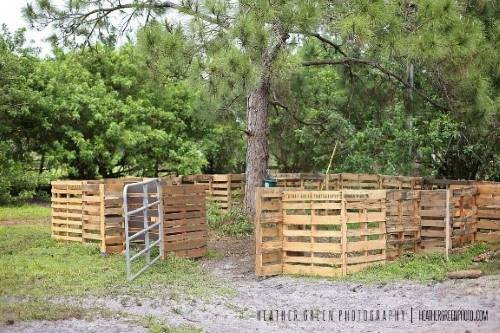 Pallet fences allow us to grow vertically either on the protected inside or on the outside of critter pens where our critters can’t reach, or both. 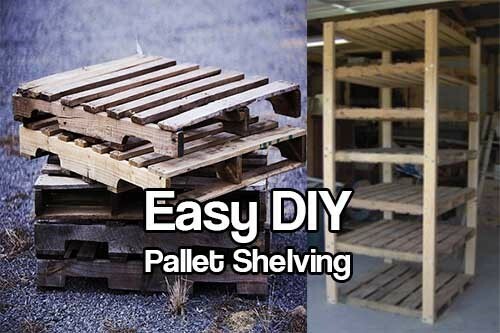 Pallets can be an excellent step into the world of DIY for beginners, as well as help everybody save money. Gardens, livestock feeders, and sheds are big enough categories to really rate their own articles, but there’s so much more. If you’ve got a need, see if somebody has a how-to using pallets, but don’t forget that pallets are also just board lumber waiting to be sanded.